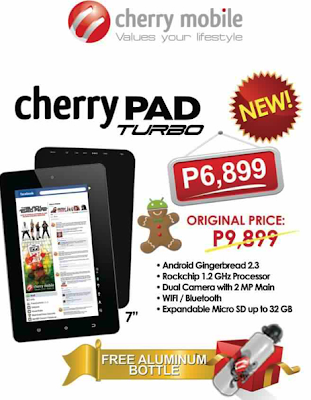 Cherry Mobile drops off 7-incher pad to Php 6,899 which is infused with Android 2.3 codename Gingerbread. It’s the Cherry Pad Turbo, the unit initially hit Php 9,899 price but CM gives the previous as an introductory price for a WiFi-only tablet. This device is clocked at 1.2 GHz Rockchip process; it comes like a new chip to our ears- that is too oversized for a single core device. All that we can say is that this is way better than your China-made aPad; it’s quite disappointing though that this doesn’t come with internal 3G modem. This could be a great item in your Christmas wishlist if you’re searching for a WiFi-only device. best buy! thanks for the info! BON, no probs...thanks sa comment. Bili na!